Two screening tools are available for use with adolescent patients (ages 12-17) in primary care settings: Brief Screener for Alcohol, Tobacco, and other Drugs (BSTAD) and Screening to Brief Intervention (S2BI). May be either self-administered directly by the patient or administered by a health professional. Asks one question per substance (e.g., tobacco, alcohol, or marijuana). Provides information on the patient’s risk level of substance use based on the responses. BSTAD and S2BI are electronic screening tools for adolescent substance use that triage adolescents (ages 12-17) into three levels of risk for substance use disorder based on their report of past year use: no reported use, lower risk, and higher risk. The tools begin with questions about frequency of use of tobacco, alcohol, and marijuana in the past year. An affirmative answer prompts questions about additional types of substance use. Each tool has been scientifically validated and is appropriate for adolescent clinical use (ages 12-17). While both tools are very similar and ask questions about frequency of use, the primary difference is in how the questions are posed and how the possible responses are formatted. It is recommended that you briefly familiarize yourself with each tool to choose the one that best suits your practice. These tools can be used by the patient (self-administered) on a tablet or desktop computer or administered by clinicians. Upon completion, the tool will automatically generate a risk level for substance use disorder based on the patient’s reported frequency of use during the past year. Implications of the score, along with suggested clinician actions and additional resources, will be provided. Who should use these tools? 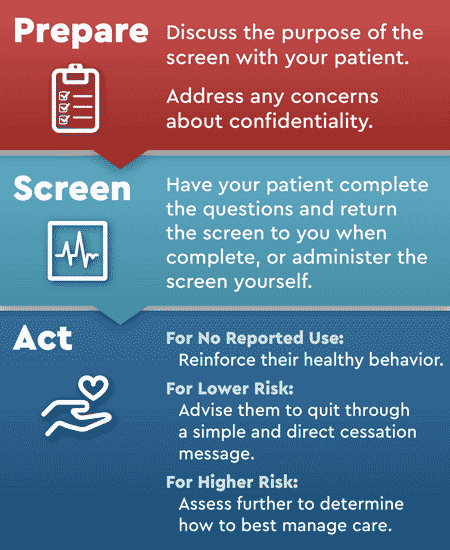 These screening tools are meant to be used under a medical provider’s supervision. They are not intended to guide self-assessment, diagnosis, or treatment decision making. The BSTAD and S2BI provide information about risk categories to provider but additional assessments are recommended to confirm diagnosis of a substance use disorder. Should I screen my adolescent patient without any indication of substance use? Why should I use a validated screening tool? Validated tools are important for an accurate understanding of a patient’s risk of substance use disorders and are more likely to correctly identify patients with substance-related problems and disorders. This knowledge is important for guiding the appropriate level of intervention. Is this screening tool appropriate for the pediatric primary care setting? Normalize discussions about substance use. Reinforce healthy behaviors and choices. Identify adolescents at risk for problematic substance use. Identify adolescents in need of referral for treatment of a substance use disorder (SUD). Is this a provider-administered or patient-administered tool? It has been found to be valid for both modes of administration, and you may choose an approach that best suits your practice flow and resources. Self-administration is recommended when possible, as it often results in better implementation. Should I share the results with my patient? Yes. Based on screen results, the tools offer an action plan based on guidance derived from expert consensus. Should I involve the patient’s parents? Maintaining confidentiality is important in order to encourage open communication with your patient. Confidentiality regulations vary from state to state, and you need to be aware of them when discussing risk levels with parents; however, certain situations (such as imminent danger) may limit that confidentiality. If you are concerned about your patient’s screening results, you may wish to discuss with the adolescent the option of including parents in future conversations. Where can I find additional tools for higher risk patients? For patients with a higher risk of SUD, you may wish to use a clinical interview for further assessment. The questions from the CRAFFT or Diagnostic and Statistical Manual (DSM) SUD criteria can be used as an interview guide. You might also conduct a brief intervention using the OARS framework (“Open Questions,” “Affirmations,” “Reflective Listening,” and “Summarizing”) and other motivational interviewing techniques. Is there a CME/CE course that will help me to integrate this tool into my practice, discuss confidentiality, and address substance use in my patients? Yes. "Clinical Strategies to Prevent and Address Adolescent Substance Use and Prescription Medication Misuse, Be Part of the Solution" is a free CME/CE available soon that provides information on how to integrate screening and discuss confidentiality, and address patient substance use. This 1 hour CME/CE was developed by NIDA in partnership with the American Academy of Pediatrics, the American Osteopathic Association, the American Association of Nurse Practitioners, the American Association of Physician Assistants, the California Academy of Family Physicians, and the American Society of Addiction Medicine, along with additional support from the American Association of Oral and Maxillofacial Surgeons, the American Board of Addiction Medicine, and the Society for Adolescent Health and Medicine. Also available are two training modules created by NIDA and the American College of Physicians that focus on the principles of patient-centered care, use of evidence-based tools, and offer practical guidance on how to integrate addressing substance use (Maintenance of Certification (MOC) credit available) and Motivational Interviewing into your clinical practice. Can you tell me more about motivational interviewing? Where can I find more information about referrals to specialty care? Also available are two training modules created by NIDA and the American College of Physicians that focus on the principles of patient-centered care, use of evidence-based tools, and offer practical guidance on how to integrate addressing substance use (Maintenance of Certification (MOC) credit available) and Motivational Interviewing into your clinical practice. How can I access the screening tool Application Programming Interfaces (APIs) and integrate them into my Web site, application, electronic health record (EHR), or other healthcare setting IT system? The developer's JSON API is available here. For additional information on how to use the content feeds, use this form to talk with our development team. How long should I expect these screens to take? While times may vary based on method of administration and inclusion of follow-up questions or assessments, these tools can typically be completed in under two minutes. These are intended for screening and are not formal diagnostic tools. Providers should use the tool that best suits their practice.